Every fortnight, we bring to you some interesting applications of solar to give you an idea on how solar is affecting and changing our world every day. We featured the much discussed Solar Powered Tuk-Tuk in our last edition and continuing with the transportation beat, this time, we appreciate a solar powered boat that is ready to go around the world. Of course, boats have been using wind energy for ages, making sea transit historically, one of the best examples of a green and clean transport, but the ‘Energy Observer Ship’ is unique as it draws complete power from solar energy, turbines and high-pressure hydrogen produced from desalination of seawater. ‘Energy Observer’ is backed by the same set of people who were behind Solar Impulse, a popular solar powered aircraft that has garnered mass interest and following. No wonder, it has been nicknamed ‘Solar Impulse of the Seas’. The ship is currently in a shipyard at Saint Malo, France and is expected to push off on its voyage around the world sometime in February 2017. Just like the ‘Solar Impulse’ aircraft, more than a 100 stops for the ship have been planned already to showcase the groundbreaking technology behind it. The boat’s batteries which will power the motor will be powered by solar energy and wind energy. In case there is no sun or enough wind energy, the boat will be powered by stored hydrogen, that would have been produced by electrolysis of water carried out by the solar panels and two wind turbines. The ship is awaiting the installation of these panels and turbines currently. 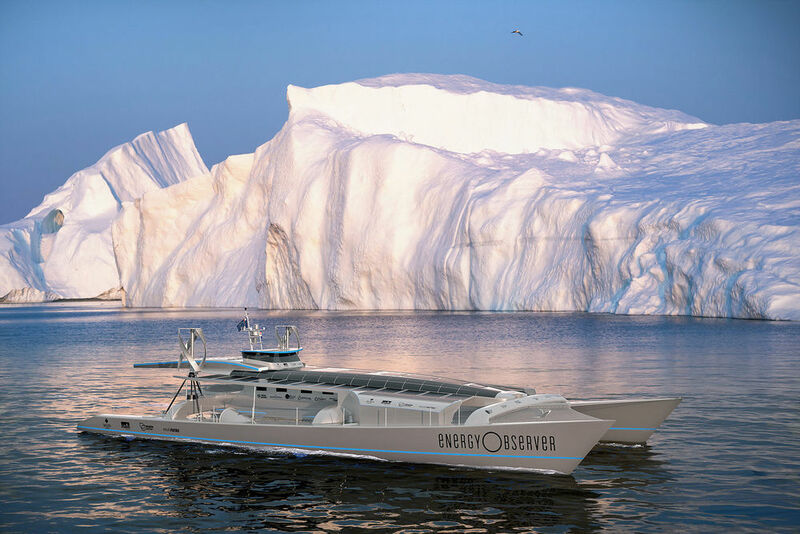 The ‘Energy Observer’ will be the first boat with an autonomous means of producing hydrogen. Add on to it that there will be no carbon emitting fuel on board, unlike 96% of the boats out there. You are, therefore, looking at perhaps the most advanced ship out there, at least in terms of its energy source. The total cost of building the ship is expected to be around $4.72 million mark and it will take a total of about 6 years to take the trip around the world. For those of us in India, this marvel is expected to visit Goa too, en route the huge global map that it plans to cover.